Once you have made the decision to install a patio cover to your outdoor space, the next thing to finalize is the “material type”. The material that you choose for your patio cover should be strong enough to withstand the environmental condition at your location and also lightweight & durable to facilitate your comfort. Here are pros and cons of three common types of materials that people use to build their patio covers. Pros: The most appealing factor of wood is the unmatched beauty and the feel of being in nature that it adds to your backyard. It can be easily resized and are available in several artistic shapes & textures for enhancing the styling of your home. Cons: Wood is high in demand and expensive. It needs regular maintenance and repainting. As compared to other material options available, it’s very difficult to extend the life of wood patio because it is prone to warping, rotting and peeling. Pros: If you are looking for something which needs low maintenance, you should go with Vinyl. It is much sturdier as compared to wood and it doesn’t need repainting every few years. Cons: Vinyl doesn’t look as pleasing as wood. It has an impression of an inexpensive look for many people. It is available in limited colors which fade with time and it can’t be repainted in more earthly colors. Pros: Aluminum is lightweight, durable, low maintenance and low cost. It can provide you the best comfort without compromising on quality. Aluminum is considered as the most affordable material for patio covers. Cons: The only disadvantage of having an aluminum patio cover is that it may make you feel uncomfortable during hot days. Being a metal, Aluminum is a good conductor of heat and you might feel hot standing under it during a hot day. Screen and shade solutions offer you the best quality patios of all the three materials types. Let us know your choice of material and our team of professionals will make it happen for you. Our stylish and customized patio covers provide superb shade and cooling when you are under the sun. 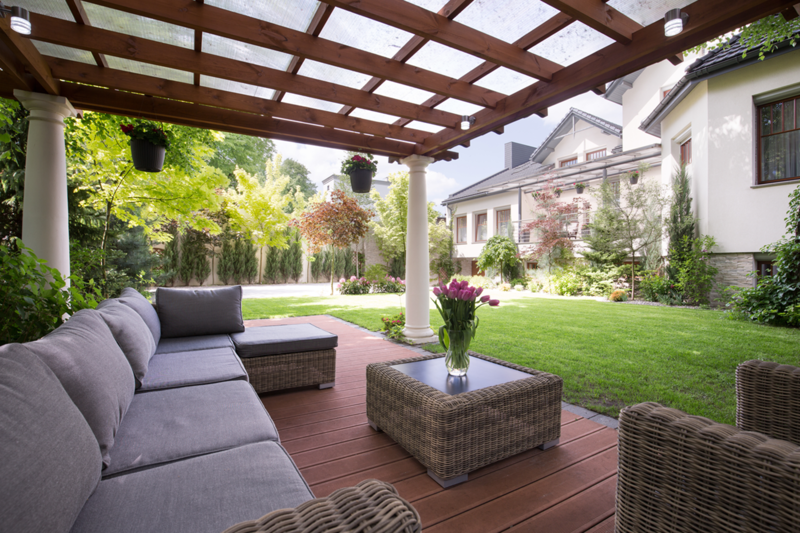 Enhance your backyard experience by installing a patio cover. Call us at (916) 532-2296 to learn more.